Spring is in the air! Spend an afternoon at the Downtown 2D for a stroll along the streets with merchants, art and snacks. Spring Fling will be held Saturday, May 26, from 12-5 p.m. with a Color Powder Party beginning at 4:30 p.m. on Division Street, downtown Pikeville. A free color packet will be provided with every $10 purchase. Shops will be having merchants’ specials, with a FREE GIFT when you make 3 Downtown purchases. Restaurants will be open, offering colorful specialty drinks. Sponsored by the Pike County Fiscal Court, the Lick Creek Horse Trail Spring Ride will be held Saturday, October 22, 2016, at the South Lake Horse Trail system. 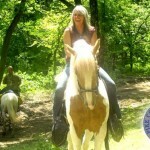 This is a free event for horse enthusiasts who wish to enjoy a scenic ride through some of America’s most beautiful back country. Featuring 68 miles of individual trails, and 1800 acres. • Gates open and registration begins at 8:00 a.m.
• Trail ride begins at 10:00 a.m.
• Lunch is served at noon. • Trail ride ends at 6:00 p.m.
• No motorized vehicles are allowed on trail system. • Visitors must provide their own horses. • For official trail ride events, be sure to arrive early for best parking. • These trails are unmarked.